Bony Murky White-washed Gray and Black Plastic Mummy Ghoul SKELATON BONEY FINGERS. Big Jumbo Size Plastic Charm, approx. 3-inch (7.5cm) long x 1.5-inch (3.75cm) wide. 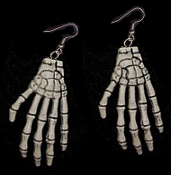 Great anatomy gift for doctor, nurse, medical student, teacher or cosplay fan of the living undead!